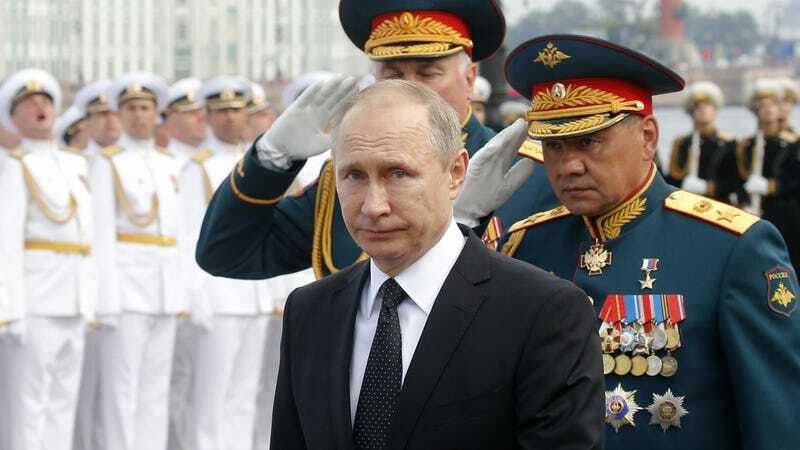 Russian President Vladimir Putin retaliated against new US sanctions legislation widely expected to be signed by President Donald Trump, announcing on Sunday he would expel or have the US otherwise cut 755 US diplomatic staff. The sanctions in question were designed to punish Russia following US intelligence agencies’ universal conclusion Russian operatives interfered in the 2016 election in Trump’s favor, namely by hacking into Democratic email systems and releasing embarrassing info about Hillary Clinton and party officials. The new legislation passed with a veto-proof majority and prevents Trump from lifting the sanctions without congressional approval. Trump refuses to acknowledge what his own intelligence agencies have concluded, and has repeatedly touted the need for better relations with Russia. But Putin trounced the White House’s hopes, saying the new sanctions made that impossible at this time. Diplopundit broke down the numbers, noting that as of 2013, US Mission Russia employed 1,279 staff—including some 301 US direct-hire jobs and 934 locally employed staff. Since the 755 number exceeds the number of US hires, it’s unclear how many of the staff Putin has directed the US to remove are actually US diplomatic staff stationed in Russia versus locals. Congressional, FBI and Department of Justice investigators are all examining whether Trump or members of his campaign team colluded with Russian agents to maximize the alleged operation’s impact. Trump’s son, Donald Trump Jr., admitted to meeting during the campaign season with Kremlin-linked lawyer Natalya Veselnitskaya, a lobbyist against prior US sanctions like the Magnitsky Act and probable Russian agent, after being promised Russian government intelligence on Clinton. Russian agents may have also penetrated deeply into US election systems, targeting voter databases, registration systems, and voting machines in what might have been a test run for future elections. According to CNN, the move was first announced by the Russian Foreign Ministry and state TV networks earlier this week. Putin’s Sunday announcement, however, marks a dangerous escalation of the already tense relationship between the two powers. Update: The plot thickens. It looks like a number of news agencies, including AFP (which has removed its original post) and Reuters screwed up and did not initially account for US Mission Russia’s local hires in their reporting. We’ve updated this post accordingly.